The most important part with yeast breads is to get the temperature right. This recipe skips the proofing stage. If you buy individual sachets of yeast that are within the use by date, it should be alive straight out of the packet and not require any proofing. If you’re concerned that your yeast isn’t fresh, however, by all means proof it first. When you’re not proofing, it’s extra important to get this first step right. Yeast is happy at about 27°C – 32°C. When warming your sour cream and milk, you can use a thermometer if you want to be extra pedantic, but I just use the wrist test. I test a couple of drops of the liquid on the inside of my wrist. If it feels warm but doesn’t burn or hurt or cause any discomfort, we’re good to go. You then make a well in the centre of your flour and yeast mixture, add the wet ingredients and start working it in. You’ll know you’ve got it right straight away from the smell the yeast gives off as it comes into contact with the warm liquid. Once you’ve worked it all in you can turn it onto your work surface and get ready to pretty it up. After a lot of kneading, you’ll be left with a soft, elastic hunk of dough. Now is when you’ll really put your dough to the test by putting it in a bowl, covering it with a blanket and letting it have a nap. If you return to find your dough has doubled in size, congratulations: your yeast babies are alive and well! Once you know your dough is good it’s really hard to go wrong from here. I split the dough into two lots, then cut them into even sections. Now the fun begins! 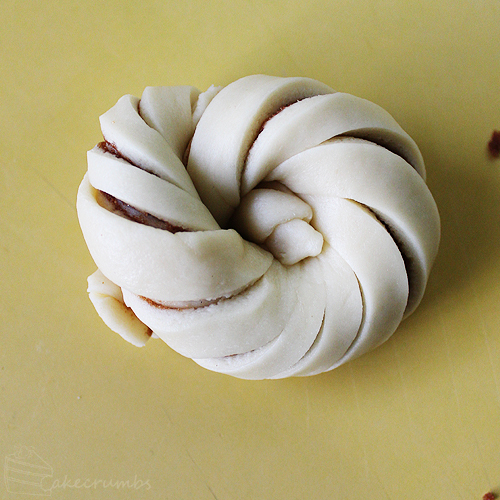 Roll out all your little pieces of dough into long oval-ish shapes. I’m so not pretty about the rolling out part. If it’s flat, thin and long, it’s fine. 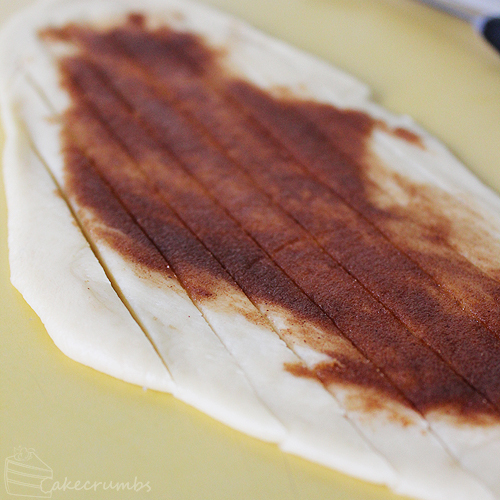 Spread a bit of the cinnamon mixture onto it, then, leaving one end intact, cut it into thin strips lengthways. Begin from the end you left in tact and start rolling it up on and angle until you have a stripey sausage, pinching the ends together to secure. 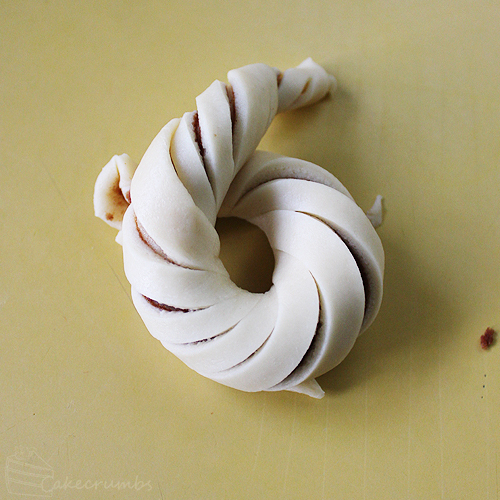 Then tie the knot in the dough: cross the two ends over one another, then wrap the end at the front over the side and up and under the back to secure. Another nap, followed by a short stint in the oven and your house will smell of fresh bread and cinnamon. How you glaze them is up to you. I, personally, don’t find the white glaze the usually adorns cinnamon buns that appealing. It obscures the prettiness of the buns and too much just makes them overbearingly sweet to me. I drizzled over a little clearer glaze than normal so you can still see all the intricate lines in the knots. How thin you cut the strips in the beginning will affect the overall look of the final bun, so keep in mind what look you’re after in the early stages. I liked making them thin so it makes the knots look really intricate and multi-layered. 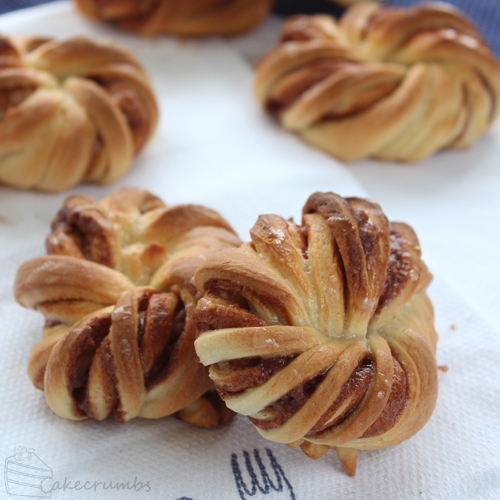 What results is a really light and fluffy but, filled with swirls of cinnamon. The outside is really crisp and crunchy, contrasting with the softness inside. 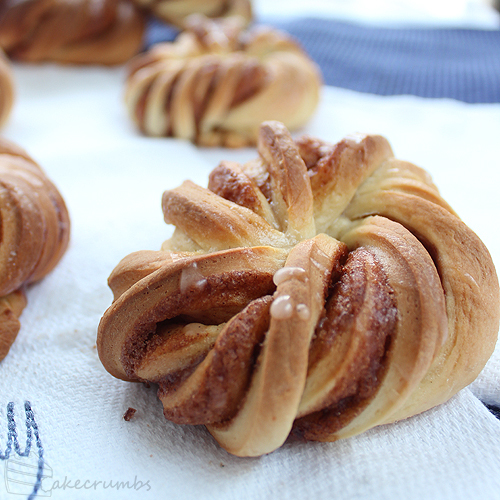 Here’s how you can make your own batch of twisted cinnamon knots. Divide dough into two equal portions; roll each potion into a sausage shape, then cut this into 8 equal portions. Using a rolling pin, roll each piece of dough into an elongated oval. 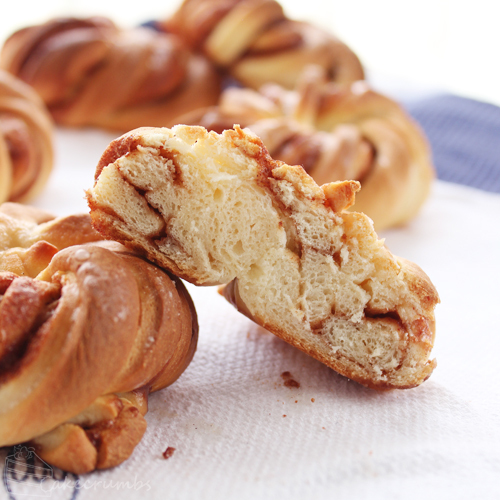 Spread with cinnamon filling. Leaving one edge in tact, slice the dough lengthways to make long strips in the dough. 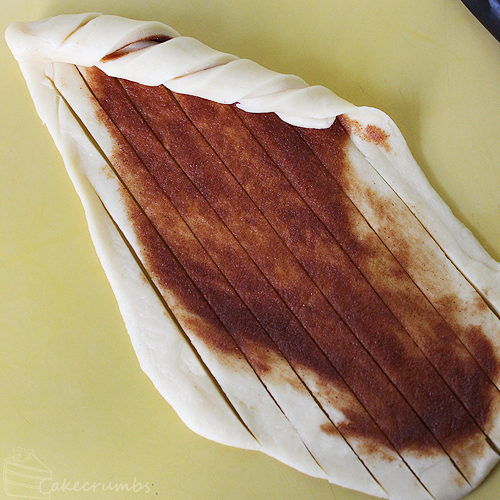 Beginning at the intact end, roll the dough up on an angle to make a striped sausage shape. Pinch the sausage at the ends to secure, then tie the sausage into a knot and place on a baking tray. Leave in a warm place to double in size (approximately 30 minutes). Preheat oven to 180°C (160°C fan-forced, 350°F). Brush the knots with the beaten egg, then bake for 20-25 minutes. Cool on wire rack. To make the glaze, combine all the ingredients in a heat-proof bowl bowl. Stand bowl over a pot of gently simmering water and stir until sugar has dissolved. 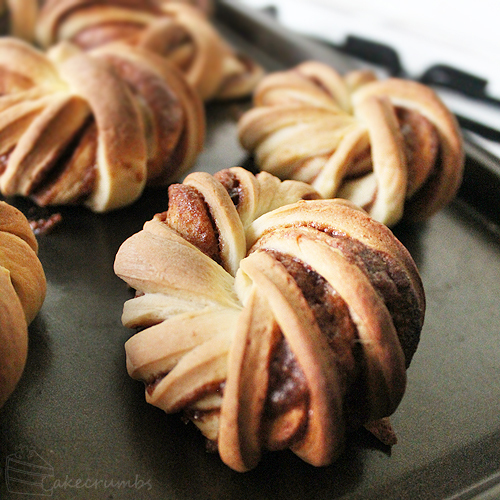 While warm, pour over cinnamon knots. I wanted to thank you for sharing this awesome recipe! I made them today and they were fantastic. I had thin milk and no sour milk so I used 1 1/2 cups of buttermilk – That proved to make the dough too sticky and I added a Lot more flour, and I found rolling them tricky, but they still came out beautifully. I look forward to making these again to perfect their look. The pleasure is all mine. I am glad to hear they turned out well for you in the end! If you find yourself needing to substitute a liquid again, it’s always best to add about half of it and gradually add the rest until the dough is the right consistency. Dough is always so particular – a little too much liquid and it’s a sticky mess! These were amazing! Thanks so much for sharing 🙂 I was wondering if you have any tips on replacing the flour with wholemeal flour? A couple of my friends have various dietary restrictions that mean they can’t eat white flour but they really wanna try these. I really want to try these next saturday. But I always use “fresh”(?) yeast so I believe I will need to do it the other way around. First add the wet ingredients to the yeast and then after a while add the dry ingredients. Or how would you do that? I just know that it works like that with my pizza dough or challah. I haven’t used it before, but I think for this recipe it doesn’t matter (since there is no proofing stage) you can add it whenever. But I’m pretty sure you have to use about 2.5 – 3 times as much fresh yeast when substituting it for dry. 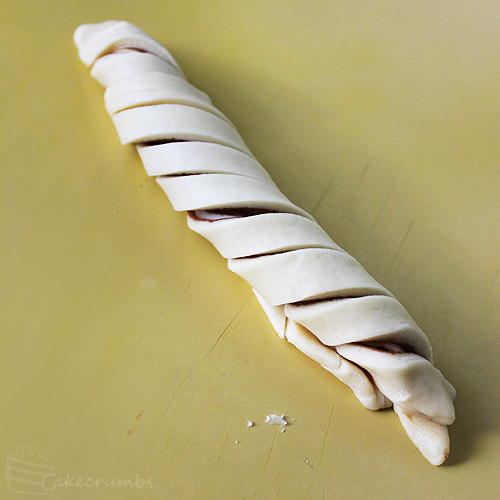 When I divide the dough in two do I then pat the dough into the tubular shape before cutting the little sections? Also, how long is the second nap? You can either pat or roll it – anything you’re comfortable with as long as you don’t overwork the dough. That step is only to help get even-sized portions. The second nap is about half an hour. This might be a very foolish question, but does the egg go in with the milk/sour cream or is it used as an egg wash? I’m making these right now, so I’m going to check my textbook for my bakery class (currently studying Culinary Management in college! :D) and see if I can find any clues, but I would appreciate feedback for the next time I make these in case I choose the wrong option. xD Cheers! It’s used as an egg wash — I mustn’t have made that clear enough! My apologies! Ive yet to eat them they r just on tgere second rest. My mouth is watering just waiting. My dough dodnt rise to much, i think as i put the egg in as part of the wet ingredients 😦 i think they will furn out ok lol. Ohwell. Thank u for sharing this amazing recepie. I love alll your cakes. First of all, I love your blog!!! Fantastic ideas and recipes! Second, I made those, and they are AMAZING! Now my boyfriend is nagging me about making more.. But just to clarify something I didn’t exactly understand- is every dough sausage cut in eight or is the overall amount of knots supposed to be eight? The overall amount is supposed to be 16. 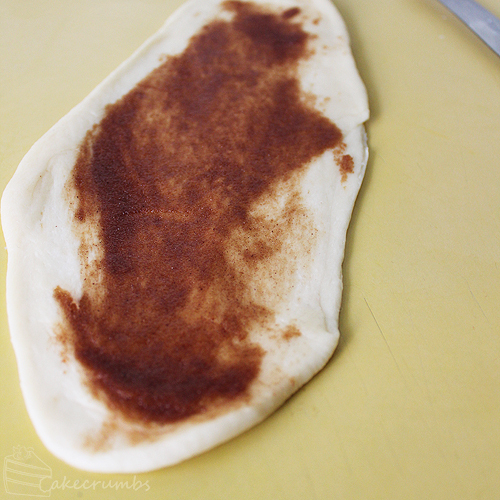 So you divide the dough in half, roll each into and elongated shape and cut each half into 8. The size doesn’t matter too much, though. I might affect baking time but either way they’ll bake the same. I have a small problem with the ingredient list though–I’m in Germany, and though I’ve googled & searched far and wide I can’t find sour cream anywhere here. Do you think it would be possible to just use more milk instead? I’ve also found instructions on how to make your own sour cream here: http://www.kurma.net/ingredients/i4.html Does that seem like the stuff you’re using? I’ve not used a substitute before so it would involve a little experimentation, but because in this recipe we heat the cream it shouldn’t be a problem to substitute. You could use more milk (or perhaps buttermilk) – just be sure to work be feel and add more flour (or less milk) if needed. The home made sour cream you linked should work well. Oh, a quick Google search reveals something called ‘Schmand’ or ‘smetana’. That might also be similar to sour cream and creme fraiche (the difference being the fat content)? Great recipe! My knots came out a wee bit dense. Any suggestions? Thanks!! It’s always a stab in the dark trying to troubleshoot from the other side of the computer, but at a guess I would say either the dough was under-kneaded or under-proofed. How long any dough has to be kneaded depends on a lot, including the weather. The 10 minutes suggested here is about what I need to get to the point of it feeling smooth and elastic, but it can differ. It’s always best to go by feel. I’ve never used it, but a lot of bakers swear by the windowpane test — that’s where you take a small bit of the dough and stretch it, the dough should appear translucent before it tears. It’s one of those tests that’s completely variable between recipes (i.e. it doesn’t work well for dense/low gluten recipes) so I’ve always just gone by whether the dough feels as described in the recipe. The other common error, under-proofing, is the same kind of thing. Time is a guide, but how quickly the bread proofs depends on a lot, especially the room temperature. It’s more important that the dough has doubled in side rather than been sitting there for the specified length of time.